^ 1.00 1.01 1.02 1.03 1.04 1.05 1.06 1.07 1.08 1.09 1.10 1.11 1.12 1.13 1.14 1.15 1.16 1.17 1.18 1.19 1.20 1.21 1.22 1.23 1.24 1.25 1.26 1.27 1.28 1.29 1.30 1.31 1.32 1.33 1.34 1.35 1.36 1.37 1.38 1.39 1.40 1.41 1.42 Waller, Maureen. Sovereign Ladies: The Six Reigning Queens of England. London: John Murray. 2006. ISBN 978-0-7195-6628-8. ^ 2.00 2.01 2.02 2.03 2.04 2.05 2.06 2.07 2.08 2.09 2.10 2.11 2.12 2.13 2.14 2.15 2.16 2.17 2.18 2.19 2.20 2.21 2.22 2.23 2.24 2.25 2.26 2.27 2.28 2.29 2.30 2.31 2.32 2.33 2.34 2.35 2.36 2.37 2.38 2.39 2.40 2.41 2.42 2.43 2.44 2.45 2.46 2.47 2.48 2.49 2.50 2.51 2.52 2.53 Van der Kiste, John. William and Mary. Stroud, Gloucestershire: Sutton Publishing. 2003. ISBN 0-7509-3048-9. 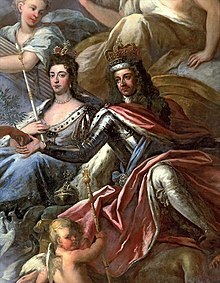 ^ The House Of Stuart: William III and Mary II. English Monarchs. 2004 [2006年9月18日]. 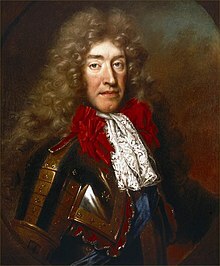 ^ 6.0 6.1 6.2 6.3 King James' Parliament: The succession of William and Mary. The History and Proceedings of the House of Commons: volume 2. British History Online. 1742: 255–77 [2006年9月19日]. 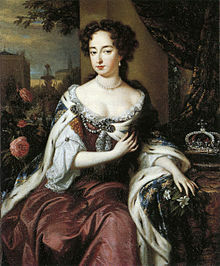 ^ 7.0 7.1 William III and Mary II. The Royal Household. [2006年9月18日]. ^ William Sancroft. Encyclopædia Britannica. Encyclopædia Britannica Online. 2006 [2006年9月21日]. ^ John Graham of Claverhouse, 1st viscount of Dundee. Encyclopædia Britannica. Encyclopædia Britannica Online. 2006 [2006年9月21日]. ^ The Contemplator's Short History of "Bonnie Dundee" John Graham, Earl of Claverhouse, Viscount of Dundee. [2006年9月20日]. ^ 11.0 11.1 Bill of Rights. 1689 [2006年9月19日]. ^ Music for Queen Mary. The Public Library of Cincinnati and Hamilton County. [2006年9月18日]. ^ Historical Facts. William and Mary College. 2006 [2006年9月18日]. （原始内容存档于2008年7月15日）. ^ Queen Mary II (Character). IMDb. [2017-10-23]. ^ No. 1249. London Gazette. 1677年9月5日: 1. ^ Brewer, E. Cobham. Dictionary of Phrase and Fable. Philadelphia: Henry Altemus Company. 1898: 891. ^ Royal Coats of Arms: England & France. Fleur-de-lis Designs. [2006年9月18日]. （原始内容存档于2011年2月14日）.